Glycolysis is the first step in the breakdown of glucose to extract energy for cellular metabolism. Glycolysis consists of an energy-requiring phase followed by an energy-releasing phase. Glycolysis is the sequence of 10 enzyme catalyzed reactions that converts glucose into pyruvate with the simultaneous production of ATP. This phase is also called glucose activation phase. In the preparatory phase of glycolysis, two molecules of ATP are invested and the hexose chain is cleaved into two triose phosphates. During this, phosphorylation of glucose and it’s conversion to glyceraldehyde-3-phosphate take place. The steps 1, 2, 3, 4 and 5 together are called as the preparatory phase. This phase is also called energy extraction phase. During this phase, conversion of glyceraldehyde-3-phophate to pyruvate and the coupled formation of ATP take place. Because Glucose is split to yield two molecules of D-Glyceraldehyde-3-phosphate, each step in the payoff phase occurs twice per molecule of glucose. The steps after 5 constitute payoff phase. The first step in glycolysis is the conversion of D-glucose into glucose-6-phosphate. The enzyme that catalyzes this reaction is hexokinase. The second reaction of glycolysis is the rearrangement of glucose 6-phosphate (G6P) into fructose 6-phosphate (F6P) by glucose phosphate isomerase (Phosphoglucose Isomerase). Phosphofructokinase, with magnesium as a cofactor, changes fructose 6-phosphate into fructose 1,6-bisphosphate. The enzyme Aldolase splits fructose 1, 6-bisphosphate into two sugars that are isomers of each other. These two sugars are dihydroxyacetone phosphate (DHAP) and glyceraldehyde 3-phosphate (GAP). The enzyme triophosphate isomerase rapidly inter- converts the molecules dihydroxyacetone phosphate (DHAP) and glyceraldehyde 3-phosphate (GAP). 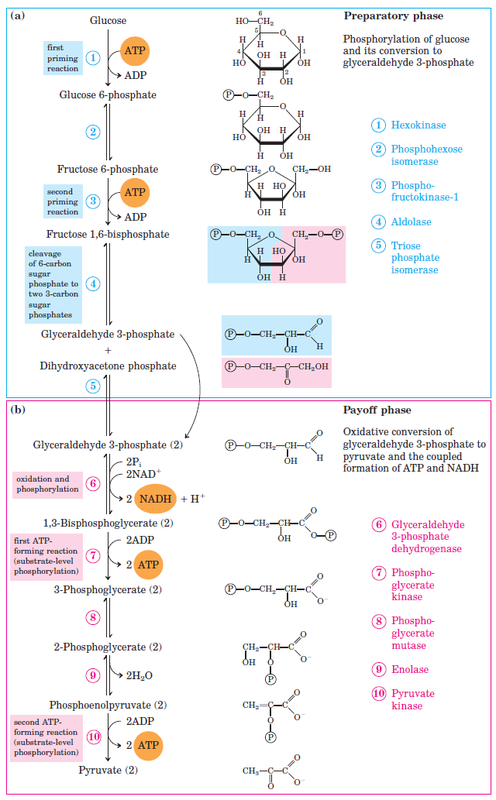 Glyceraldehyde phosphate is removed / used in next step of Glycolysis. Glyceraldehyde-3-phosphate dehydrogenase (GAPDH) dehydrogenates and adds an inorganic phosphate to glyceraldehyde 3-phosphate, producing 1,3-bisphosphoglycerate. Phosphoglycerate kinase transfers a phosphate group from 1,3-bisphosphoglycerate to ADP to form ATP and 3-phosphoglycerate. The enzyme phosphoglycero mutase relocates the P from 3- phosphoglycerate from the 3rd carbon to the 2nd carbon to form 2-phosphoglycerate. The enzyme enolase removes a molecule of water from 2-phosphoglycerate to form phosphoenolpyruvic acid (PEP). The enzyme pyruvate kinase transfers a P from phosphoenolpyruvate (PEP) to ADP to form pyruvic acid and ATP Result in step 10. Although 2 ATP molecules are used in steps 1-3, 2 ATP molecules are generated in step 7 and 2 more in step 10. This gives a total of 4 ATP molecules produced. If you subtract the 2 ATP molecules used in steps 1-3 from the 4 generated at the end of step 10, you end up with a net total of 2 ATP molecules produced.